If you’re interested to learn more about what goes on in Paris at night, check out our 2019 INSIDR Paris Night Guide! 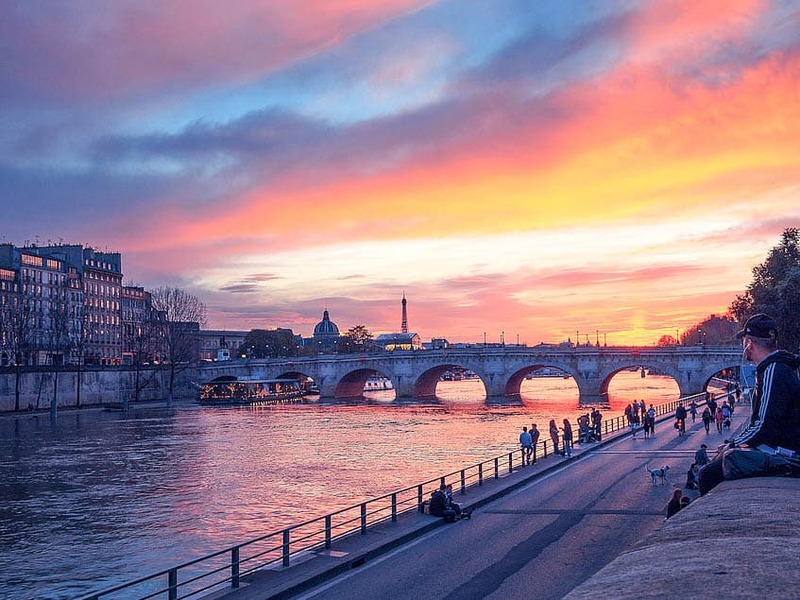 Paris is perhaps most famous for its monuments, magnificent landscapes, food and unbeatable cultural scene, but the city has so much more to offer, especially after sunset. It’s no wonder that Paris is called the City of Lights, it’s meant to be explored after dark. If you want to blend into the Parisian crowd at night, look no further! Read on for our INSIDR tips on the things to do in Paris at night, best shows in Paris at night, Paris streets at night, attractions and practical information like Paris metro hours to make the most of your Parisian nights! If you’re looking for romance in Paris at night, you can start the night off with a romantic dinner and then head to one of Paris’ rooftop bars to enjoy the sunset. Or, how about a show at the world famous Moulin Rouge cabaret followed by a walk around the cool South Pigalle area, also known as SoPi by locals? You can also go for a late night visit of the Louvre and then hit the dance floor at one of the capital’s many clubs. Whatever your after-hours style, Paris has something for you. The cabarets of Paris are internationally famous for their glamour and iconic dancers. The French capital has over ten cabarets, but our favorite remains the iconic Moulin Rouge. The Moulin Rouge’s history dates back almost 130 years and it helped contribute to French cultural and artistic growth. The iconic venue and famous windmill has the world’s best Cancan dancers and has inspired countless writers, poets, and painters. Capturing the energetic, romantic and unique atmosphere is simply impossible. Catch a show to see the beautiful and gifted dancers, elaborate costumes and magical Féerie main act in Paris at night. You can book your tickets directly here! As mentioned above, we highly recommend hitting the cabaret during your time in Paris at night. Visiting the Moulin Rouge will surely be an unforgettable experience. 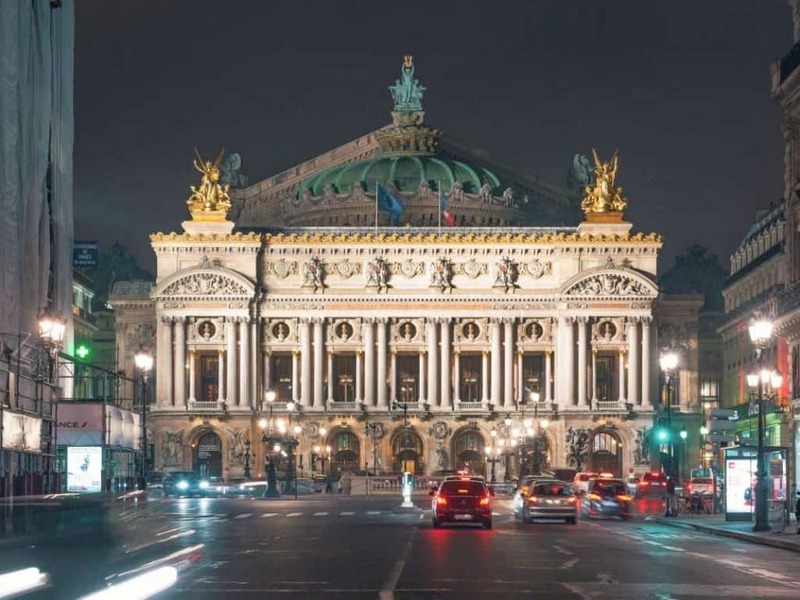 Attending a performance at the Opera Garnier is another nocturnal Paris must-do. The beautiful venue hosts ballets, concerts and of course the opera. The Palais Garnier is arguably one of the most famous opera houses in the world. Even if you’re not an opera fan, we definitely recommend seeing a show to visit the amazing building. The opulent house was completed in 1875 and features red velvet seats, marble staircases and a Chagall-painted ceiling. Check the Opera Garnier website to see what shows are available during your travels. You can also check out our favorite places to catch a live show in Paris. As one of the culture capitals of the world, Paris has a lively music scene. The city itself is home to three huge arenas – Paris Bercy, the newly constructed U Arena and the iconic Stade de France. 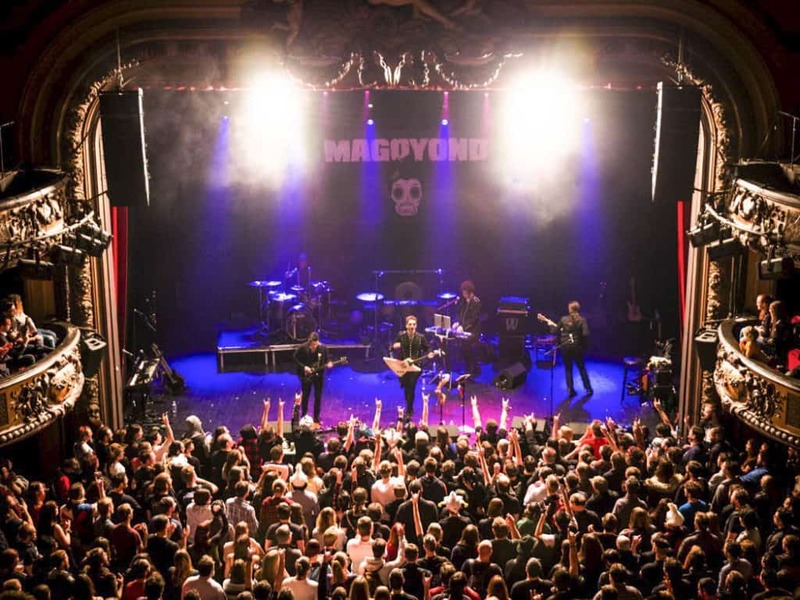 Some of the most famous, slightly smaller, music venues include the Olympia, the Elysées Montmartre, the Zenith and Le Trianon. Make sure to book ahead as tickets tend to sell out fast, especially at some of the smaller places. For classical music lovers, Paris also has numerous concert halls including the Saint-Julien-le-Pauvre Church and the Sainte Chapelle. Like with fashion, Paris at night has an avant-garde,world-renowned reputation for its amazing nightlife scene. 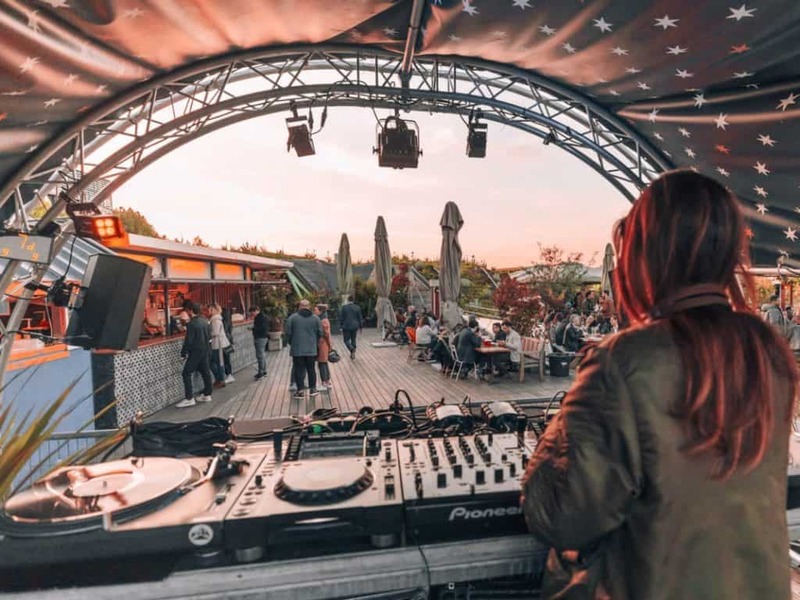 Outdoor and rooftop clubs are definitely the hottest new trend. Our personal favorite outdoor clubs include Debonair, Wanderlust, Concrete and La Clarière. They all have great music, delicious cocktails and outstanding views of the city. Read our dedicated guide to the best clubs in Paris at night for more of our favorites. Paris also has numerous bars with dance floors, if you’re looking for a good balance between bar and club. 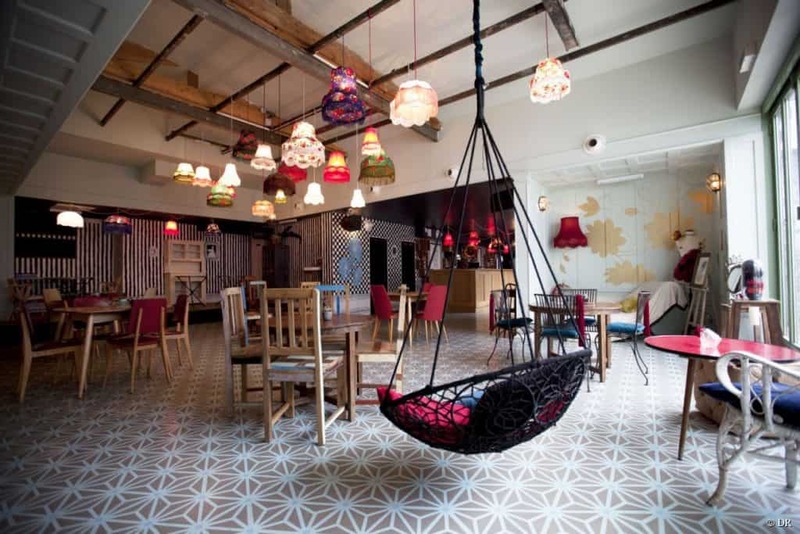 At INSIDR, we recommend checking out the Comptoir Général, Rosa Bonheur and of course Le Carmen. Paris has been swinging by the rhythms of jazz for over a century. Legends including Bud Powell, Chet Baker and Miles Davis have left their marks on the Parisian jazz scene. The art form remains flourishing and still packs clubs and bars alike. 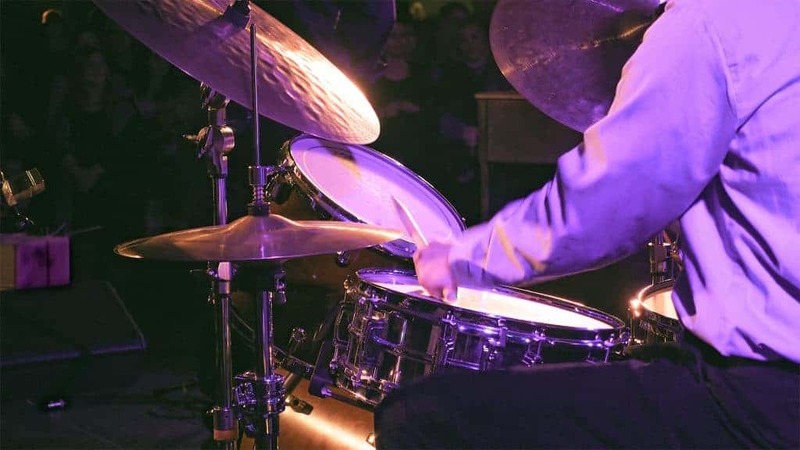 It’s no surprise that the city is home to numerous iconic jazz bars. The Caveau de la Huchette is housed in a building that dates back to the 16th century and has been a jazz hotspot since 1949. Head to Café Laurent in the heart of Saint Germain for some classic smooth sounds. We also recommend the Duc des Lombards, one of the most well-known clubs in town. Drummer plays on drum set and cymbal with drumsticks on the stage. Jazz or rock concert performance entertainment. Close up shot with soft selective focus. Enjoy a cultural evening out and avoid the weekend crowds at one of Paris’ best last-night museums and galleries. 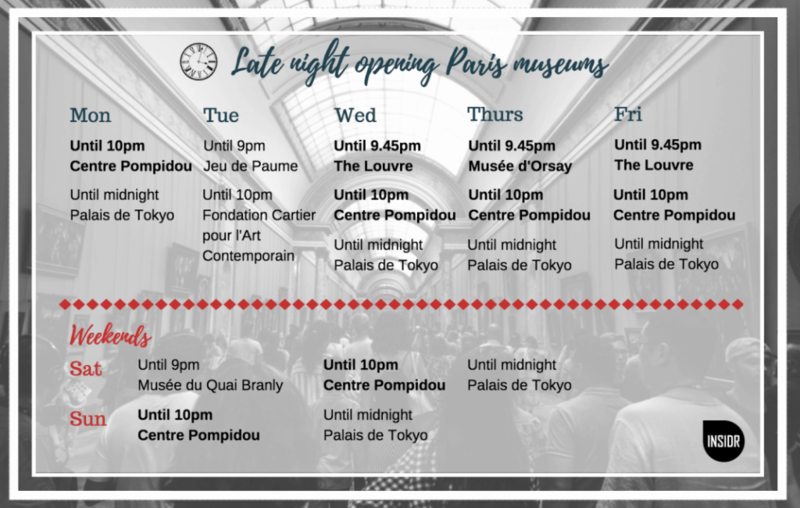 Most museums have late-night openings in Paris at night at least one night a week making it super convenient to squeeze everything into your Paris travels. The Louvre is open until 9:45PM on Wednesdays and Fridays. The Centre Pompidou and Palais de Tokyo have late-nights on Sunday, Monday, and Wednesday. On Thursday nights head to the Musée du Quai Branly, Musée des Arts Décoratifs or the Musée d’Orsay. It goes without saying that seeing the Eiffel Tower is an absolute must during your time in Paris at night. The magnificent light show takes place on the hour, every hour after sunset. To fully enjoy the dazzling views of the Iron Lady we recommend heading to the Passerelle Debilly. 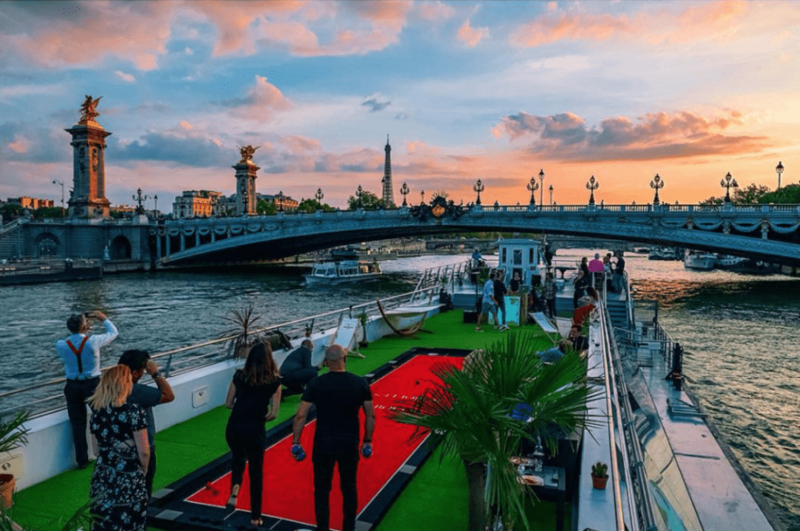 You’ll also have an amazing view directly from the Vedettes de Paris Night cruise. There’s nothing quite like sailing by the sparkling show after sunset. We’ve also put together a list our favorite spots to make sure you get the absolutely perfect, Instagram-worthy shot of the Eiffel Tower. 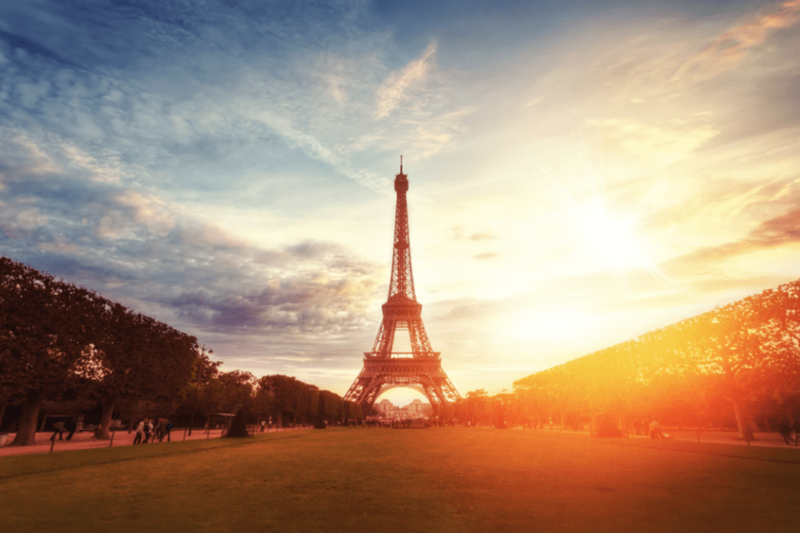 You absolutely must (and we mean must) set aside one evening to enjoy the sunset in Paris. The sunset is always beautiful, however, in Paris, it’s simply nothing short of extraordinary. It would be a shame to be stuck in the metro or inside during the magical hour. The Arc de Triomphe and Notre Dame Cathedral provides a spectacular view of the city sunset. The 284 steps are a small price to pay for such a stunning view. The top of the Tour Montparnasse, for those who prefer taking an elevator, is another great vantage point. Paris at night truly does come alive as a special kind of magic takes over the city. After all, it is called the City of Lights for a reason. However, after a long day of exploring and walking around the city, you might need a break. The Open Tour night bus is the perfect option to admire the beautiful monuments and bridges at night. 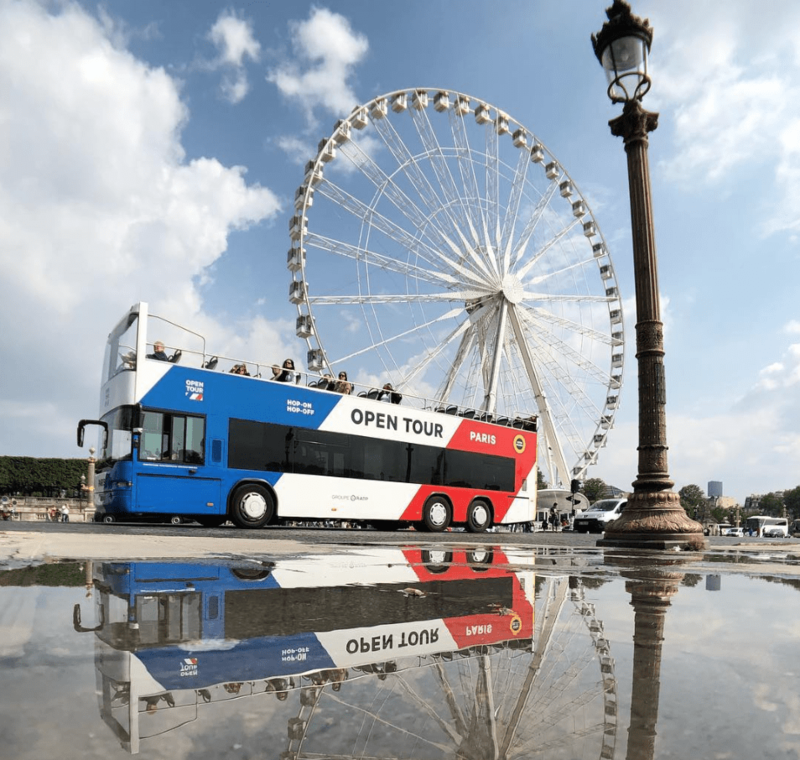 Take a seat in the comfortable double-decker bus and enjoy spectacular views of the Louvre, Notre Dame, the Eiffel Tower and much more. 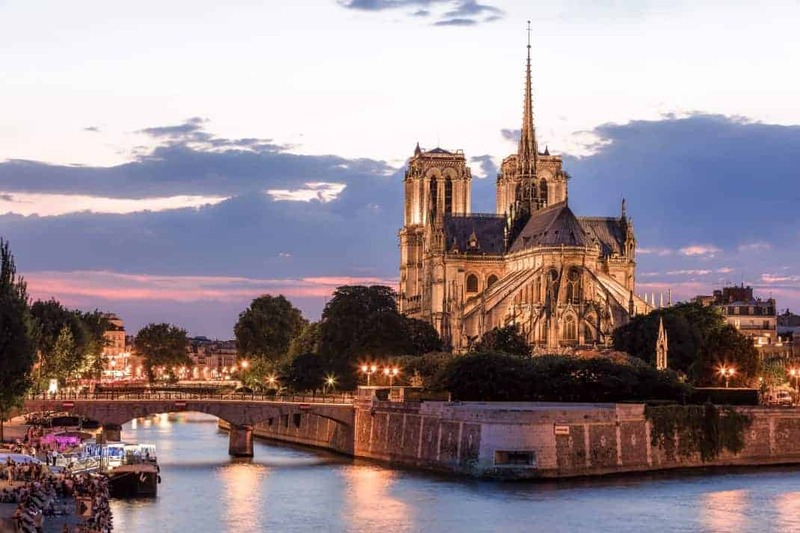 If you’re looking for a romantic night out or a meal with an unforgettable view, you can’t spare a Paris dinner cruise. Most cruises depart from the Eiffel Tower or Musée d’Orsay and sail past the Notre Dame Cathedral, Place de la Concorde and Louvre museum. 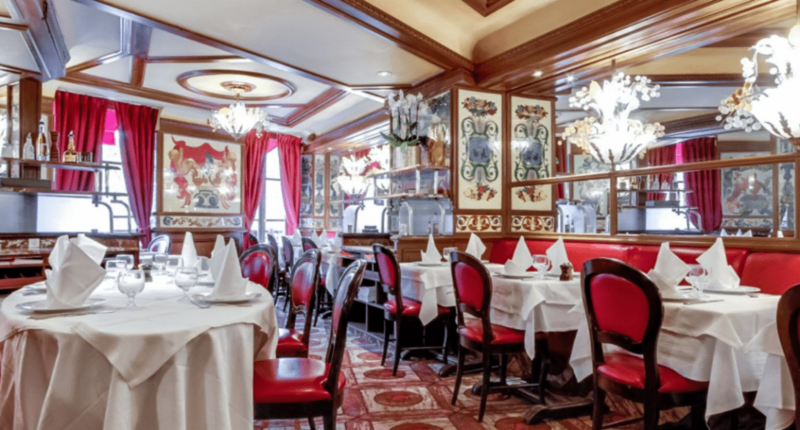 Take in the spectacular monuments while enjoying gourmet French cuisine. Viator has a great selection of cruises, at all price points. You can choose from an all-out gourmet feast to simple drinks. We recommend continuing your evening with a show at Moulin Rouge or a nice stroll down the Champs-Élysées. Looking to add some mystique to your time in Paris at night? Know that there is Paris and then there is hidden Paris. The French capital is home to an array of secret cocktail bars. Some of our favorites include Candaleria, Moonshiner and Lavomatic. Perched on top of the beautifully designed Haussmann buildings, you’ll also come across a number of awesome rooftop bars. Enjoy unique views of Paris at night while sipping on a delicious drink. There’s really no better way to end the day. We particularly recommend Kong or Communion. 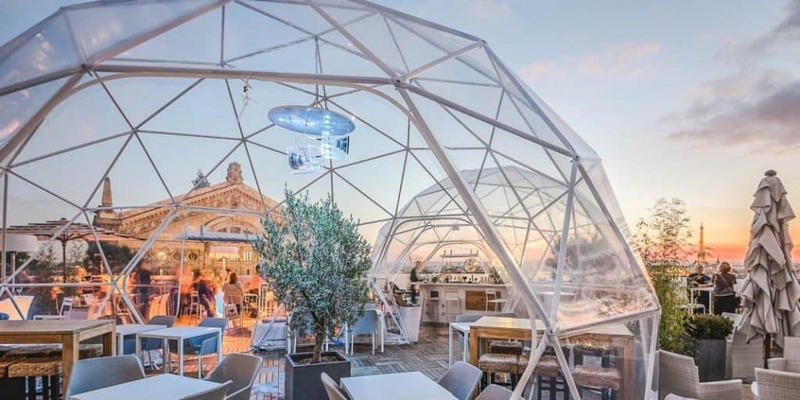 For the best view of the city, head up to the Ice Bar on the roof of the Galeries Lafayette. However, our favorite secret rooftop hang is definitely the Bar à Bulles. This hidden gem is on top of the famous Moulin Rouge, what could be more iconic? The entrance was recently moved to the Cité Véron, a historic street in Montmartre where Boris Vian and Jacques Prévert once lived. They also recently revamped their menu to include tapas and a to-die-for brunch. Cocktail-wise Bar à Bulles has a wide selection of original creations. We’re personally fans of the “Mojito Moulin Rouge” and “Le Harry”. By now you’re probably starting to understand how much Paris has to offer after dark. 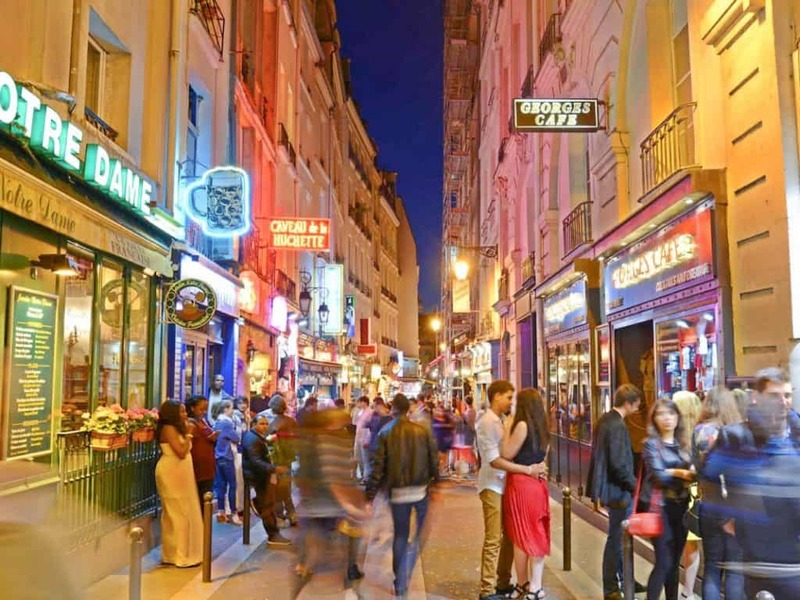 Whether you’ve just landed after a long flight or have been out on the town, Paris also has a great selection of late-night bites to keep you energized all night long. Au Pied de Chochon was the first restaurant in the city to stay open all night and has since become an icon. Located in the 1st arrondissement, Serge Gainsbourg and President François Mitterand have both eaten there. We recommend the French onion soup. It’s so good that the recipe hasn’t changed for over 65 years. Chez Denise, also located in the city center, is open until 5AM, six days a week. This typical French eatery has particularly delicious steak tartare. For the more adventurous, we recommend the Tripes, a French classic. If you find your stomach grumbling and you’re near Montmartre, head to Bouillon Pigalle. This trendy restaurant has delicious roasted chicken, salmon tartare and homemade desserts. The service is also excellent in the recently renovated bistro. If you’re planning on exploring the City of Lights at night but worried about safety, you can relax! Paris at night is safe. As with anywhere else in the world, we recommend taking basic safety precautions when out at night and keeping an eye on your belongings. The city center and other popular neighborhoods including Le Marais, Latin Quarter and Bastille are vibrant both day and night. If you need some more tips on Parisian nightlife, check out our favorite bars and guide to the red light district. Lucky for you, Paris at night has an excellent public transportation system as well as other options for getting home late at night including bike shares and Uber. If you’re out past midnight, you’ll need to check public transportation hours (more on that in a second!). Taxis are available 24/7 and are generally easy to find in most neighborhoods. Uber is also hugely popular in Paris at night and a convenient way to get home. 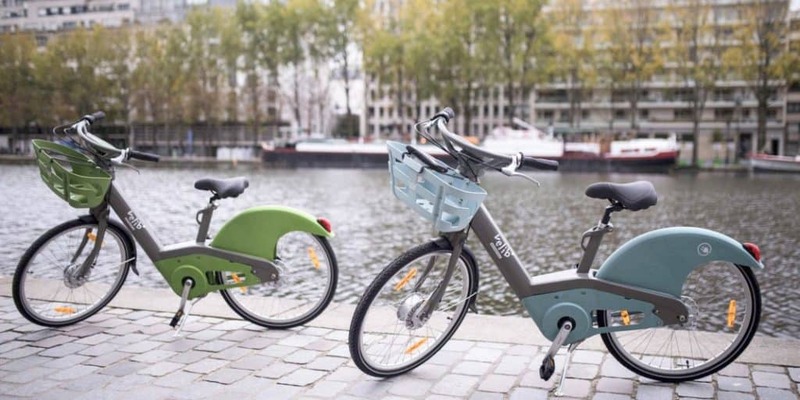 If you’re feeling sporty, grab one of the Velib’ bikes and pedal your way home while enjoying the lovely Parisian monuments at night. 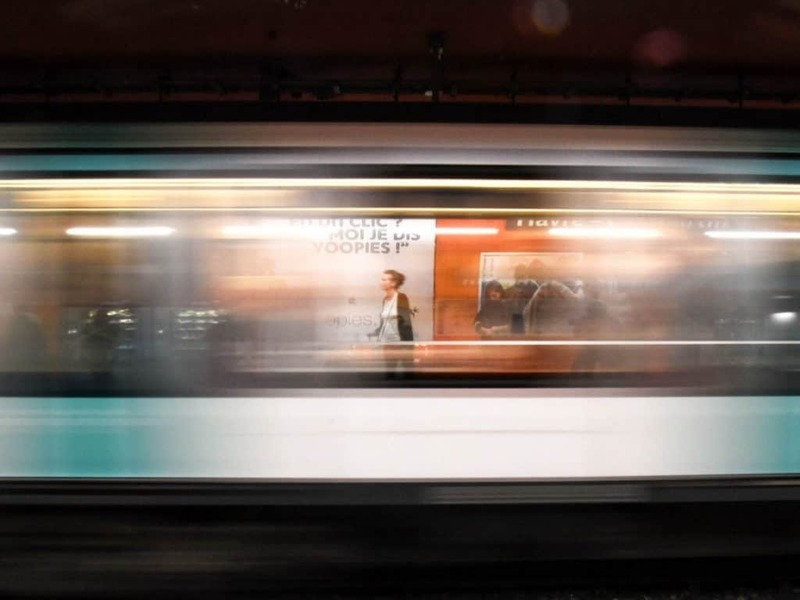 Though not yet available 24/7, the Parisian public train system has gradually extended opening hours over the past few years. The metro and RER run from approximately 5:30 AM – 12:40 AM on Sundays to Thursdays. On Fridays, Saturdays and days before public holidays, trains run from 5:30AM – 1:40AM. You can check specific timetables on the RATP website depending on the line you’ll be taking. You can also use the city’s night bus system, Noctilien, to get around at night. The network branches out from five major points in the city: Châtelet, Montparnasse, Gare de l’Est, Gare Saint-Lazare and Gare de Lyon.